I started my career as a fireman in 1993 and in 1994 I was accepted into Special Operations. My department was small and everyone knew each other. The SCBA bottles used by our fire department at that time was a yellow 2216 psi bottle and our Special Operations Team wore a green one hour bottle. The green hour bottles were heavy! But it made finding my crew on scenes easier. In 2003 my fire department upgraded our SCBA and all the company's in my fire department went to a gray 4500 psi bottle. This made it very difficult to identify my crew on scenes. 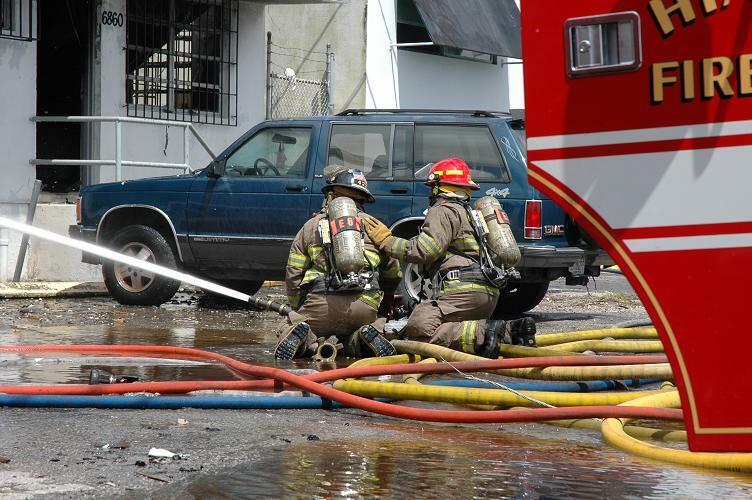 We searched the internet and contacted SCBA manufactures for a solution to this situation. I needed to find a way to make my crew stand out from others. Then, "F.D. Company Identifiers" was invented! I made the first identifiers for my Special Operations crew in 2003. After some testing we placed them on all of our department's SCBA. After a few months other neighboring departments started to ask about them and the word spread from there! F.D. Company Identifiers was founded in 2004. We have now been in business for over 11 years and serve over 800 fire departments with our products. As you look through this site you will find products that were created by F.D. Company Identifiers and some products that were designed by our customers. All of the identifiers are custom made to fit your needs. The F.D. Company Identifier is a simple device that attaches to the front and back of the SCBA. It is comprised of heat retardant materials with high visibility reflective markings. It does not in any way compromise integrity or void the warranty of the SCBA. It will also not interfere with the use of the SCBA. It is easily removable, but can also be left on the SCBA even when a bottle is being changed out.